Established in 1999, Acorn fencing are a professional and friendly family run firm. We specialise in fencing, decking and gates. Fencing - We offer repairs and new lines of fencing, including concrete posts and gravel boards, heavy duty close board and traditional lap panels, constructed close board, picket fencing and post and rail. Decking - We have designed and constructed a variety of decks. From the plain and simple to those including split levels, ballastrading, including low voltage lighting and steps. We have even installed a beer fridge! 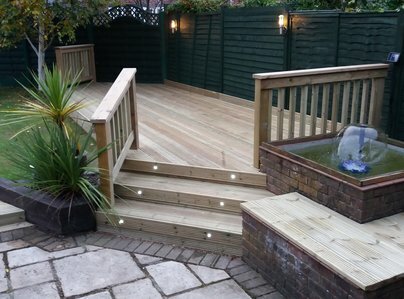 We construct decking using softwood, hardwood and composite materials. Gates - We supply and fit a large range of gates and gate hardware, including double gates, single gates and picket gates. We are happy to offer our advice and expertise for your particular needs. We offer a free no obligation quote. Prompt, professional, tidy and cheerful. The work was completed well (better than I had expected!) They were careful not to trample flowers in the border. This job was complete to the estimate. Erection of new fence done to the agreed schedule & budget. Mr Feltham was courteous, professional & very helpful. Anything I was not happy with was put right amicably, he was well organised & left the site tidy - I would certainly recommend him. The work was clearly quoted for with explanations that took into account a range of choices without being in anyway patronising. Good communications throughout the process were helpful and reassuring. Work was carried out quickly, cleanly & to a very high standard by friendly and courteous people. 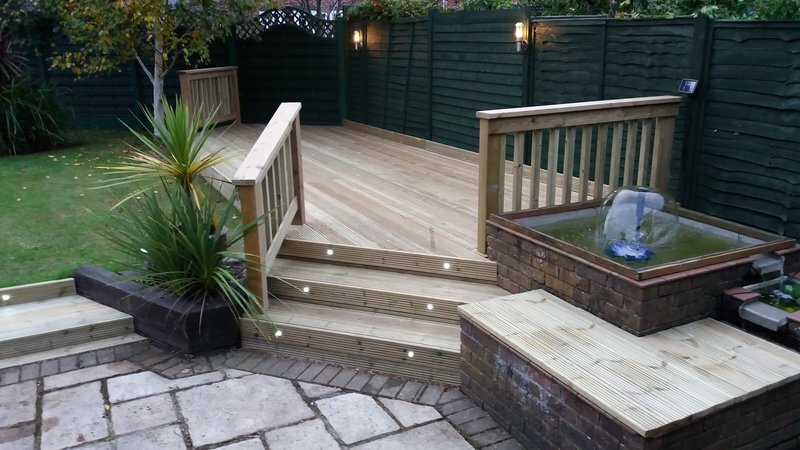 This was an excellent piece of work & I have no hesitation in recommending Nick & Acorn Fencing & Decking. Nick responded to all my mails promptly, arrived on the arranged date and time. Work was cleaned up each night and work was completed within the 3 days quoted. Our boundary wall was taken down and removed cleanly. This was very important to us as we have a dog and the fence being added was a boundary fence onto a road. Excellent service. Kept to the promised date and completed in just one day. Site was left tidy. Communications were good and they were quick to return calls and submit a quote. Fence looks amazing. The trader was reliable, prompt and courteous. The fencing job he did for us was very challenging and other trades turned it down. Nick gave careful consideration to every step of the project. This estimate came in lower than others, excellent value for money, he gave us confidence from our first meeting and was highly professional. Quality workmanship and competively priced. After searching Which? 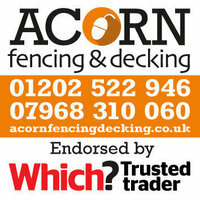 Trusted Traders I contacted Nick of Acorn Fencing & Decking for a quote to replace our rear garden fence. I had a very quick reply and very promptly Nick visited and spent some time explaining our options and discussed our needs. The next day Nick sent a through a quote listing all materials and work to be carried out which was competively priced. I accepted this quote and the work was agreed. When Nick and his work partner Matt carried out the work they were very quick, working to a high standard, and finished the job without fuss and in no time at all. The materials used were of good quality and the finished job was of an excellent standard. It was a pleasure dealing with Nick from start to finish and Acorn Fencing would definately be my first point of call should I need similar work completing in the future. Highly recommended. A point worth mentioning was that, during the work, Nick noticed that one of the hinges on my shed door had broken. Unbeknown to me he kindly replaced and fitted two brand new hinges at no extra cost! Fantastic service. Nick and Mat installed 142’ of new fencing in my garden using concrete gravel boards and close board panels, the results are outstanding and will probably out last me .They worked tirelessly through some of the worst weather you could imagine, the job was completed as scheduled and for the amount of work involved in clearing the site a bargain .I would not hesitate to use Acorn fencing again or recommend their services. We needed to replace a fence in our garden which is on a sloping site meaning the job was complex. Nick gave us a lot of time, talking through the possibilities and explaining what he planned to do. He arrived on time and the work was carried out in a very professional manner. Nick and Matt were friendly, helpful and very willing to ask when they were uncertain about anything or if there were options, which kept us in the loop. The materials used were of good quality and finish. We are extremely pleased with the work and would employ them again. Removal & erecting back garden fencing to correct budget. Very helpful & polite.